Some decorative trends are simply so genius, they simply never go out of style. If you’ve watched home improvement shows lately, you’ve heard about wainscoting (pronounced like “Wayne’s Scotting” or “Wayne’s Cotting” depending on whom you ask). But it’s okay if you’re a little fuzzy on what that term really means, where the idea comes from, or how to best use wainscoting in your own home. First, let’s time travel a bit. Gird your loins and we’ll go to medieval Europe, where wainscoting was a decidedly practical invention. In a time before modern insulation, rooms were cold and dank. Depressing! So wood panels — nearly always riven oak — were nailed across the lower half of walls to keep dampness away. The word “wainscot” itself comes from the Dutch word wageschot, which referred to that type of oak board. As heat from a fireplace rises, there was no need to insulate the upper half of the room. Over time, the use of these frame-and-panel boards became decorative. As simple as wainscoting appears on the wall, it actually has quite a few segments. 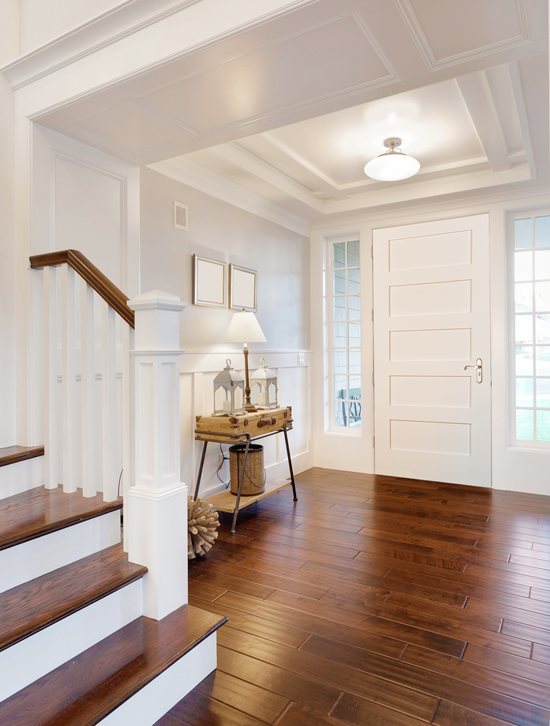 At the top, you’ll find the “wainscot top,” also called a chair rail, while the bottom part that runs along the floor is referred to as shoe moulding. In between are horizontal rails, vertical rails and flat panels (or the flat part might be instead of the wall itself). Thankfully, we’re no longer hammering boards into the walls to stay comfy as we sup. But the look of wainscoting remains popular, as it adds elegance and eye appeal to walls. 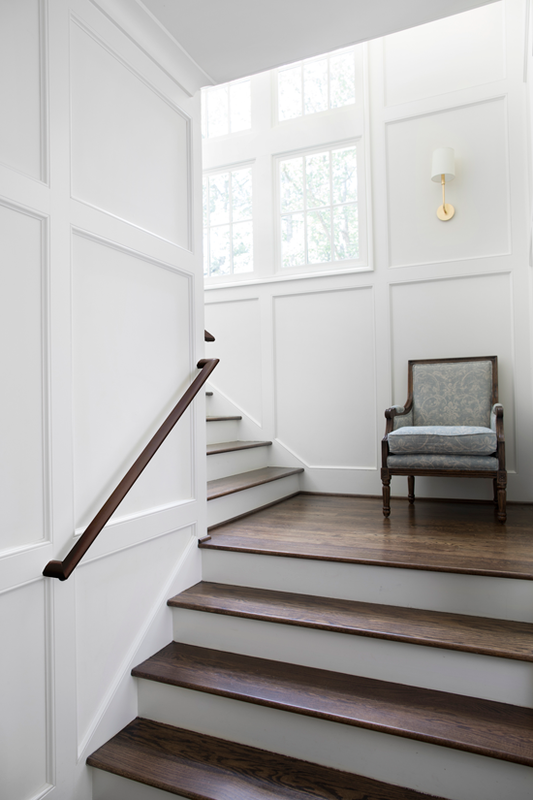 Using wainscoting can soften a large room; provide character to a brand-new or boxy-feeling space; or, can create historical charm within a cottage or bungalow style of home. 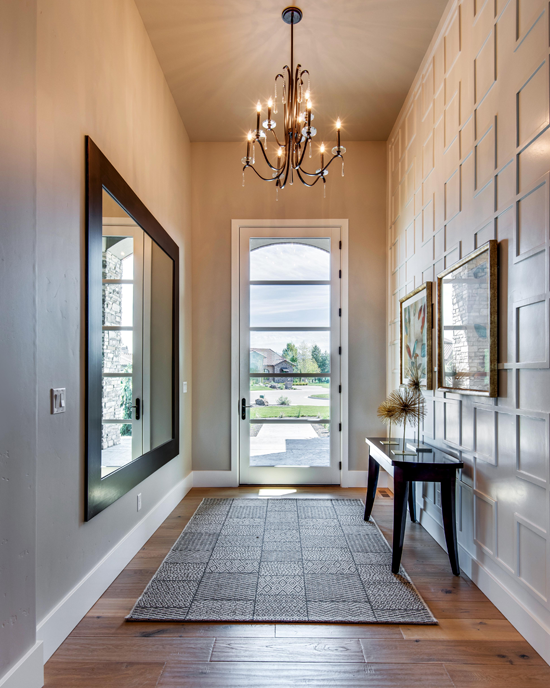 Wainscoting has been a hot trend as of late, but, since it’s appeared in homes for literally hundreds of years, it’s considered a classic style that is unlikely to go out of fashion. 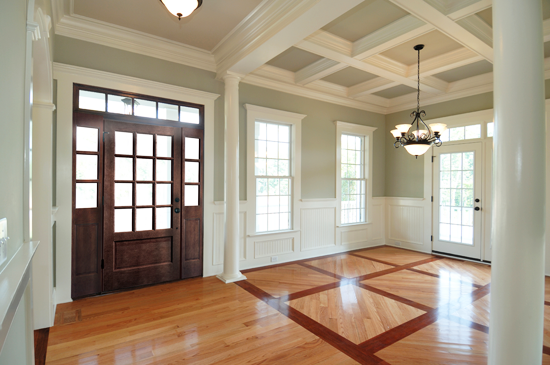 Let’s take a look at some installation ideas courtesy of Woodgrain, which specializes in wood moulding and doors. 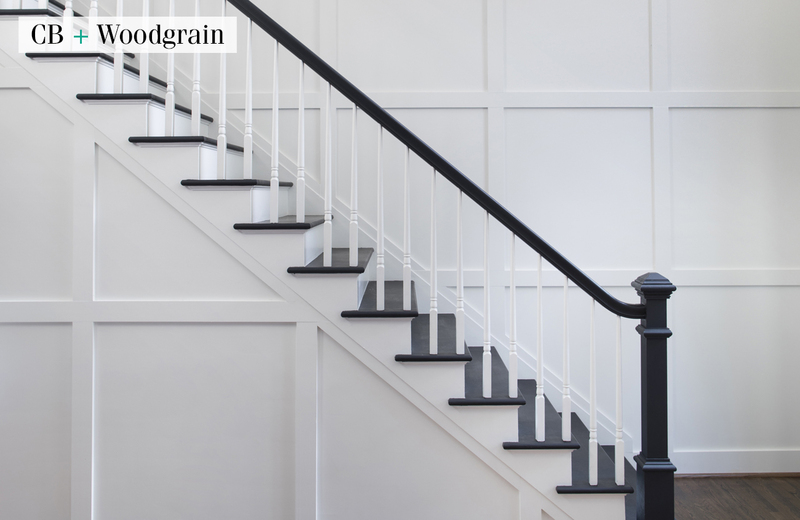 A staircase becomes a work of minimalist art, with the dark railing and steps contrasting against the white wainscoting. 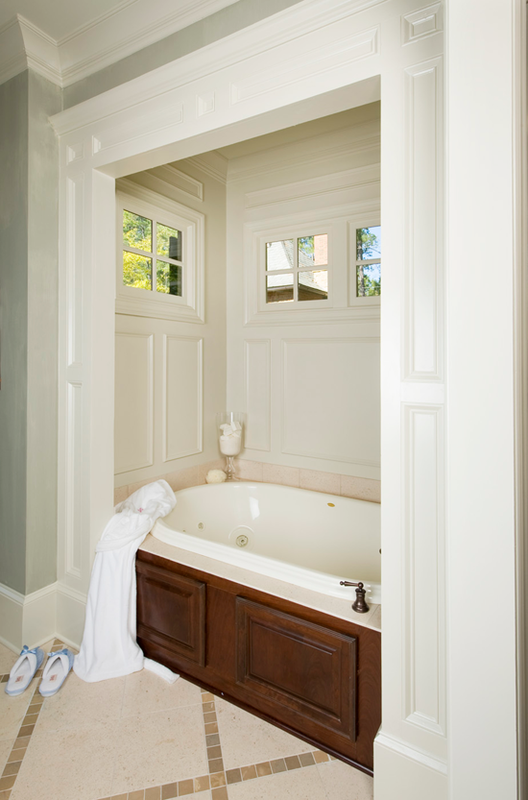 This master bathroom transformed into a showstopper with the addition of wainscoting surrounding the soaking tub. 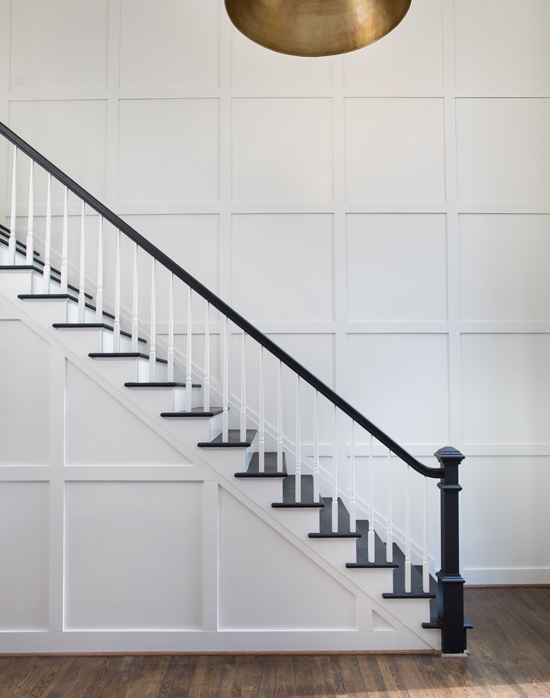 Wainscoting is best deployed using the rule of thirds; one third up the wall, two-thirds up, or, as shown here, all the way up. In this hallway, the wainscoting plays with the shapes of the framed art and mirrors, acting as another repeating set of rectangular art. For a large space like this, having many architectural elements going on feels appropriate, while for a smaller space, a simpler treatment, such as just wainscoting, would work well. When designing this home office, the rest of the home’s style was taken into account, including the exposed ceiling beams. The rugged wainscoting chosen thus respects the integrity of the home’s look. Wherever you decide to put wainscoting in your home, it’s a great way to add design flair, enhance a living space, and to boost value when it comes time to sell. Learn more about Woodgrain here.